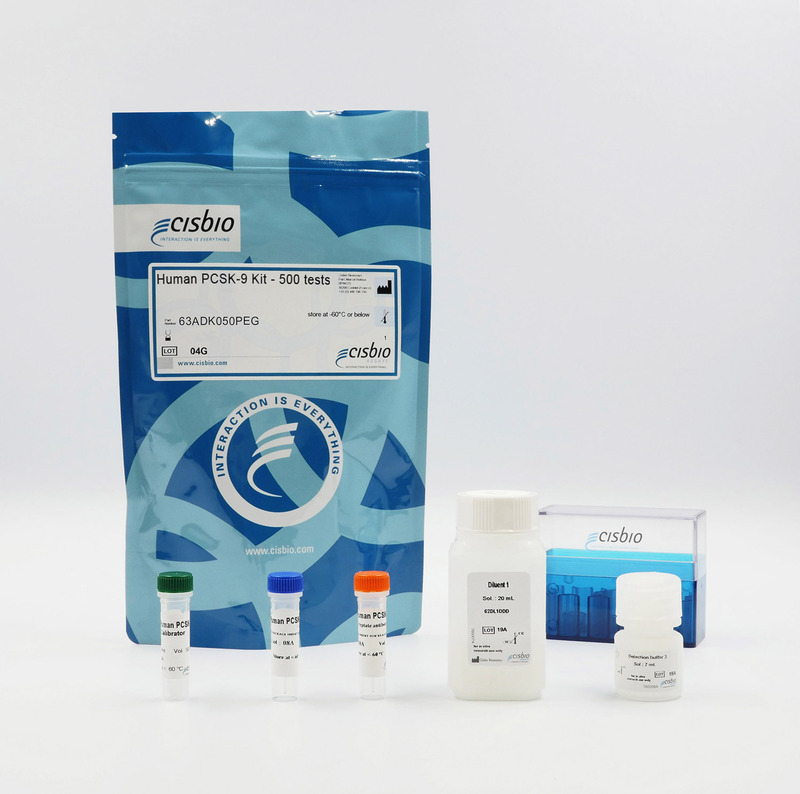 The Human PCSK-9 kit is designed for the rapid quantification of Proprotein convertase subtilisin/kexin type 9 in cell supernatants. PCSK-9 (proprotein convertase subtilisin/kexin type 9) is a member of the proprotein convertase family that plays an important role in lipoprotein homeostasis. PCSK9 binds to the receptor for low-density lipoprotein particles (LDLR) within extracellular fluid, triggering ingestion of LDL-particles into cells. PCSK9 blocking can lower blood LDL-particle concentrations. The PCSK-9 kit is designed for the detection of proprotein convertase subtilisin/kexin type 9 directly in cell supernatants. Human PCSK-9 is measured using a sandwich immunoassay involving two specific human PCSK-9 antibodies, respectively labelled with Europium Cryptate (donor) and d2 (acceptor). The intensity of the signal is proportional to the concentration of PCSK-9 present in the sample. The PCSK-9 assay features a streamlined protocol with only one incubation step following the sample/calibrator and Antibody conjugates dispensing. The antibodies labelled with HTRF donor and acceptor may be pre-mixed and added in a single dispensing step to further streamline the assay procedure. This protocol requires a single 2-hour incubation period at RT.